In life, every day is a series of negotiation whether we realize it or not from deciding on who will clean up the house or who will pick up the children, from hiring someone to crack a deal on what terms, deciding a location while planning a trip and much more. In every relationship whether personal or professional, we need to go through certain negotiations. Negotiating skills are very important if we look at it from a commercial point of view as every deal made, contract signed, business combinations taking place, buying or selling a product, functioning in different countries etc. But not everyone is good at discussing things or lacks convincing power or restrain themselves to talk out of fear. Many of us face some or the other problems while negotiating with the other person. Am I sounding too rude? Is this the right time to put up this question? Where will this discussion end? Am I able to convey properly? I hope the other side doesn’t get this statement wrong/offensive? Do I need to tell him this? Why is he not getting along? Am I leading this negotiation on the right track? Is it going to be productive? What if I am not able to bargain well? These questions are infinite as we cannot determine the mindset of the person sitting on the other side but we can work on to change it by applying proper techniques and by moving ahead through proper steps. Not everyone is good in negotiations or getting things worked out in their favor but this does not mean we can’t build them. With the proper skills and steps anyone can become a good negotiator and no doubt it is one of the most important tool these days which help people understand each other’s needs and give what they want, we don’t realize but by giving them what they need we are one step ahead of getting what we want. Building trust is the foremost step one should keep in mind while making a good relation and which helps in bringing a sense of comfort while discussing. Making the other person trust you is one thing which makes the conversation easy and lessens the probability of the opponent judging you. If the other person trusts you he/she is more likely to open up quickly and share what they want out of this deal or negotiation otherwise it takes quite long to break the ice and understand what the exactly another party is seeking out of this negotiation. Having a certain amount of transparency is quite helpful in maintaining trust but not too much. Don’t show those cards which can pose you as weak in this discussion. In today's era, everyone clearly knows how to further their own interest and ascertain their benefits first. During negotiation one should focus on the needs of the other person and should show how those needs can be fulfilled by this negotiation. Knowledge of the product or the deal is of no use for them if it cannot meet their needs or is not beneficial for them at all. If the other person feels the importance of his needs in the on going discussion he/she will show more interest and will try to figure out ways to talk about more on same and how fast it can be done. All you have to do is to show the opponent a WIN-WIN situation out of this negotiation. Listen more A good negotiator should know how to listen more rather than talking as listening allows you to get the appropriate catch and let you know the whole story of the other’s side without putting too much effort. To know the needs of the other person and to play on those needs it is important that one should listen properly and to everything the other party has to share. Put a question, maintain a silence for a moment and let the other party concede. Assert and express your needsYou should never forget your interest, should know how to put it on the other side of the table, don’t afraid to ask what you want. Remember successful negotiators believe that everything is negotiable or there is nothing which cannot be negotiated. One should always know how to tell the other person what they need without being aggressive i.e. in a non-threatening way. Being assertive means putting your needs in front of the other party and showing due respect for other’s needs as well. There should be nothing which implies disregard to the needs of the opponent. Don't forget in a negotiation you are representing yourself so the other party has to give you the thing you want and then only can take one thing from you, therefore feel free to express what you feel and what you want out of this discussion. Look for common good not area of conflicts When two parties have agreed to discuss then there must be some common grounds, even very less, for which they have agreed to try to settle it. One should know the seek of common interest for both of them and then proceed further. If the parties agree to take stance on the common grounds which gives the negotiation a positive start only then you should move forward to accelerate negotiation and try to talk about the things the other party needs to adjust or deal with the specific or individual needs of the parties. By looking into the common grounds and not conflicts the negotiation is seen from a positive perspective by both the parties and they become more willing to settle it further and feel productive outcome out of the negotiation. Remember that both the parties have some interest in concluding and if the negotiation does not end with a positive result it's not only your failure or you will be the one losing but the other party also has something to lose, so be careful before you agree and if you don't feel like agreeing then don’t. Never show what will you lose if the negotiation does not end well rather show to the opponent what will they lose if they do not collude and ask them to imagine what could be the situation if they walk out from this discussion, they will realise the importance of the conclusion for their benefit and will show their inclination towards settlement. Walking away is not walking away from the solution but a way of asking the other party to negotiate more. Don't consider walking away as an option but never feel hesitated to walk away if the settlement is against you. Don't take anything personally Negotiations often fail as the parties forget their professional responsibility and get sidetracked by their personal feelings and concerns which are not at all related to the subject matter of the negotiation. Remember you are negotiating on behalf of a very big management of your company not for personal reasons. Don't get affected by the other side’s behavior and never take anything personally during negotiation as the party on the other side is acting solely out of professional accountability. 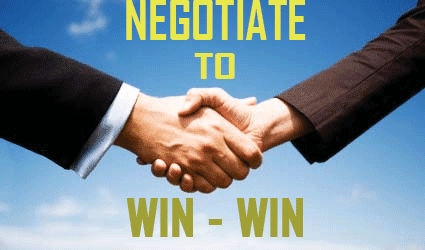 Above mentioned were the key rules to be kept in mind while negotiating. I have something to ask if you allow me? I am willing to understand this matter fully, so tell me? What you have to say on this …? Let me come up with this? Here’s something I have been wondering about? I am stuck can you help me out here? This is a very interesting point it deserves a clear answer. Good point! I need to gather my thoughts to answer that. I am glad you brought that up. Now here what the problem is. I need to ponder the ramifications before I speak. Please take special note of this point. I think you might understand the importance of this. I have to say this as it has significant value in it. Let me be very clear about this. This seems very important to discuss. You got what you wanted and even more. I think this is the best deal which you can avail. Take a call go ahead this is best for you. Leaving it will be insane. This seems worth your efforts and time. There has to be a mid way for both of us. We can work out something better. The proposal is good, but I think we should discuss more. You will need to lean forward a bit. Unfortunately, this is not the best for me. I can’t accept it right now. I think we should not move forward with this. I would love to say yes, but I can’t get it past my superior. I apologize, but I can’t accept this. Compromise is the best way to go. I am willing to listen to you if you do the same. We have to arrive at a compromise. Let’s get this done once and for all. Let’s not stretch it further and get over with it. You need to cooperate with me, please. Let’s start it from now.